we work seamlessly together to deliver memorable and exceptional yacht experiences for all our guests. Having worked many jobs since young, Asyranni (also known as Ranni) finally found his dream job as a yacht skipper/captain. With his years of experience in the service industry before joining the Ximula Sail family in 2016, Ranni brings an exceptional level of attentiveness towards ensuring guests feel safe and comfortable during our yacht charters. Behind his serious face and tough look is a cheerful attitude, a playful soul and a quiet determination. Despite having no experience in sailing when he joined the family, Ranni mastered the techniques of sailing within 2 days during a short team expedition within local waters, proving that sailing is not that complicated. Since then, he has sailed on board Ximula to many islands in Indonesia, including the Lingga Islands and Tambelan Islands. Other than helming yacht charters and taking good care of Ximula, Ranni also has a myriad of other random hobbies, like bartending, DJ-ing, motorcross, and entertaining his 2 beautiful daughters. Ranni is Singaporean Malay, and speaks English and Malay. Being a TV actor for more than 20 years, Darren has become a household name and a face easily (and excitedly) recognized by most Singaporeans. Known for his sense of adventure, he has lived with his family of 6 (including 4 adorable children) on board his yacht, Gracefully, for close to 3 years. Prior to Gracefully, his children also grew up at sea on board his previous 3 yachts. With his vast knowledge about the ocean and marine life, and his experience in sailing and diving, Darren hopes to educate and inspire more people to appreciate the great outdoors through yacht charters. On board Gracefully, Darren has sailed extensively within the region, exploring both the west coast of Malaysia to Phuket, Thailand, and the east coast of Malaysia to Koh Samui, Thailand. Darren is a certified RYA Day Skipper. Other than being a celebrity, a father and our captain, Darren is also a NAUI Master Scuba Diver and enjoys golfing. Darren is Singaporean Chinese, and speaks English and Mandarin. Leaving his family with 2 sons, Victor travelled all the way from Philippines to Singapore to earn a steady income so he could give his sons a good life and education. While he is still brushing up on his English, Victor is the team's super handyman/engineer who can fix literally anything on board, has crawled into every corner and hole on our yachts, and is constantly finding ways to make things easier and better. His strong work ethic is motivated by his dream of owning a piece of land in Philippines, on which he can build his own house with a sea view and rice fields and a private dock for Ximula & Gracefully to visit. Victor has assisted Darren and his family on board Gracefully during many expeditions within the region, including Malaysia, Thailand and Indonesia. Victor is a certified RYA Competent Crew. Other than tirelessly scrubbing the deck of Gracefully, Victor is always serenading us with his voice and guitar. Victor is Filipino, and speaks English and Tagalog. An outdoor lover since young, Minqi has always dreamed of traveling the world as part of her job. Leveraging on her family yacht Ximula, she is fortunate to be living the dream when she founded Ximula Sail in June 2014. She hopes to share her passion for the outdoors with other like-minded Singaporeans who are always looking for opportunities to get out of our crowded city. Despite her poor psycho-motor skills, she picked up sailing from her father, TC Wong, and has sailed with the family on various expeditions on board Ximula to many beautiful destinations including Phuket and Koh Samui in Thailand, Pulau Tenggol and Redang in Malaysia, and the Lingga and Tambelan Islands in Indonesia. Other than assisting guests on board during our yacht charters, Minqi is also the face behind our Facebook Page, Instagram account, this amateur website, our customer hotline and email. Minqi is Singaporean Chinese, and speaks English and Mandarin. Known for his out-of-the-box thoughts and lifestyle, Wong has loved boating since he was a teenager who was always going out fishing with his friends. Pursuing his passion, he used to own a 34ft Riviera powerboat docked at Keppel Marina back in 1994, but had to let it go when finances were tight. After 20 years of regret from letting it go (while working hard to grow his business, Zhaplin Work Pte Ltd), he has finally re-achieved his dream of owning a sailing catamaran, Ximula. Other than sailing and enhancing his catamaran, Wong also loves rockclimbing, mountain climbing, traveling to unexplored areas, and basically anything sun and sand and sea. 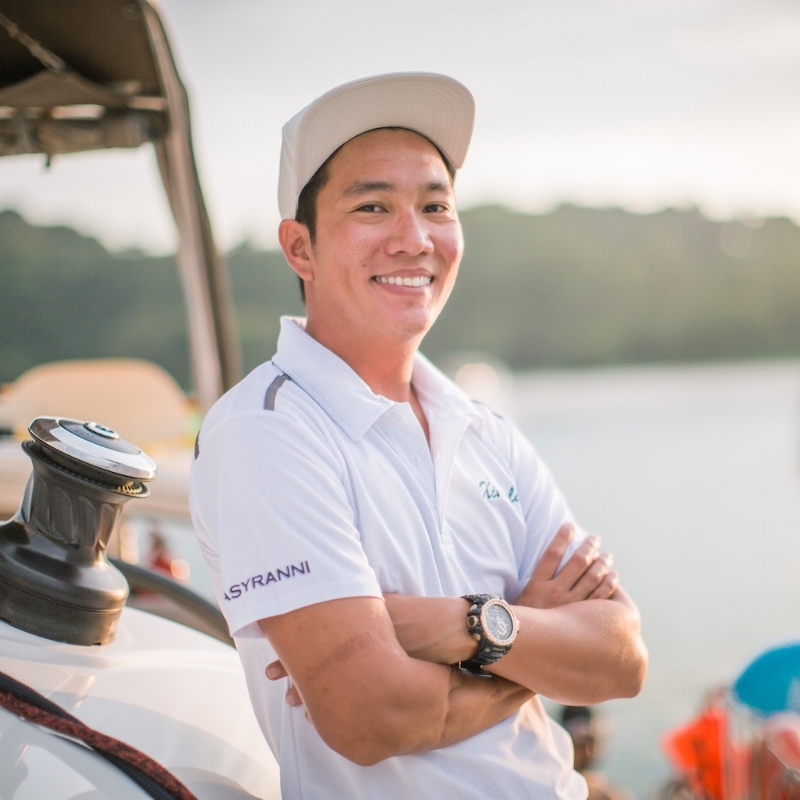 Since 2016, Wong has retired from helming Ximula to continue his sailing adventures around Southeast Asia on board his 43ft Beneteau monohull sailboat, Ximula II (currently based in Singapore) and his latest baby, a 50ft Leopard sailing catamaran, Ximula III (currently based in Phuket, Thailand). Wong is Singaporean Chinese, and speaks mainly Mandarin and a little English. Venture out of your comfort zone and explore the charming, idyllic islands within Southeast Asia, whether it is a short 4D3N sailing getaway to nearby islands, or a longer 8D7N sailing expedition to remote destinations you've never been to.